Stone is a Civil parish and market town in Staffordshire, England, 7 miles (11 km) north of Stafford and 7 miles (11 km) south of Stoke-on-Trent. It was an urban district council and a rural district council before becoming part of the Borough of Stafford in 1974. Stone Parish Church, dedicated to Saint Michael the Archangel, is at the south end of the town located on what used to be Stone Priory. It was commenced in 1753, and finished in 1758. The present clock dates from 1896. Christ Church stands on the north side of the town, where the population is still increasing. It was erected in 1839. The canal still dominates the town. Many canal side sites have in recent times been taken over for modern day use including The Moorings, a development of apartments based on the old Stubbs warehouse. Apartments and housing surround the old Trent Hospital, once the workhouse. Housing developments also border the canal. Commercial traffic has now been replaced by the leisure craft that pass through Stone each year. 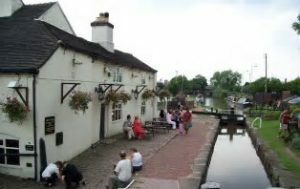 The Canal Cruising Company today operates from the historic site of the canal maintenance and boat building operations of the Trent and Mersey Canal Company. This restored docks complex with its workshops, by Yard Lock, continues to be used for the maintenance of pleasure craft and historic boats. In 2010 a new marina opened just south of the town, below Aston Lock, with moorings for pleasure craft, a farm shop and a café. State education within Stone is based on the three tier school system, with a range of first and primary schools, two middle schools (Walton Priory Middle and Christchurch Academy) and a high school (Alleyne’s Academy). Independent education is served by the Catholic St Dominic’s Priory School founded with the convent of the same name in the 19th century by MotherMargaret Hallahan when the school was originally known as “Blessed Imelda’s Enpension School”. Staffordshire Fire and Rescue Service has its headquarters just south of Stone. Yarnfield Park Training and Conference Centre just outside the town is a major training centre for the UK telecommunications industry. It is owned by BT Group and run by Accenture. Stone is the key UK manufacturing site for the Quickfit laboratory glassware system which finds widespread use in many school, college and university science departments. The National Association of Chimney Sweeps is located in the town. The Stone Food and Drink Festival takes place the first weekend in October and brings together the very best in local produce and cooking talent. It attracts in excess of 20,000 visitors to the town and runs for one week in total with the ‘main event’ on the town’s Westbridge Park on Friday, Saturday and Sunday.